Imagine yourself at a party or a bar or perhaps at a meeting, now imagine you meet someone new there and become real-life friends with them. The next obvious logical step would be to add them over on Facebook to become friends in the online world, right? Well, if you and your new friend have an NFC-equipped smartphone and have a certain app installed, you can just tap the two together to become Facebook friends! No more of that awkward waiting period between you sending them a request and waiting for confirmation! The “certain app” we mentioned in the starting paragraph is called Add Friend (Facebook). The concept behind Add Friend is based on how, in the modern world, people (apparently) don’t exchange numbers, they exchange Facebook names. It is based on Near-Field Communication technology (used in services like Google Wallet) which allows two devices to exchange data when they are near each other. After installing Add Friend, you just touch two mobiles back-to-back and tap Add to become friends. It works offline as well so that you become friends as soon as you get internet access. 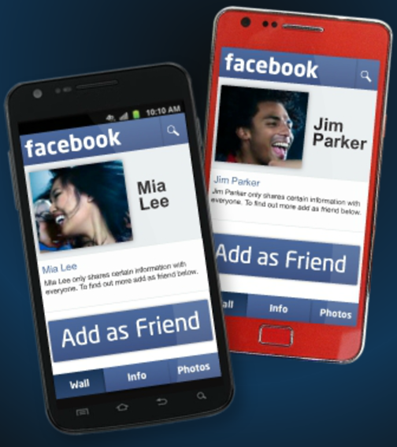 Touch 2 mobiles back-to-back to become friends on Facebook. Add him/her to Facebook via mobile … instantaneously … even offline. There are a couple of pre-requisites, though. Firstly, your phone must have Facebook for Android installed. Secondly, and this is the biggest limitation, your phone must be NFC-equipped. Currently, only a handful of phones like the Nexus S, Amaze 4G and Galaxy S II Skyrocket come with NFC chips inside. There is a very low probability of you and your new-found friend having an NFC-equipped smartphone with Add Friends installed when meeting for the first time. This app then, while excellent in concept, will never be used much unless and until every Android smartphone comes with NFC. Still, if you’re interested, the app can be downloaded for free from the link embedded below. Be sure to let us know what you think of it in the comments section over on our Facebook page if you manage to meet all pre-requisites.